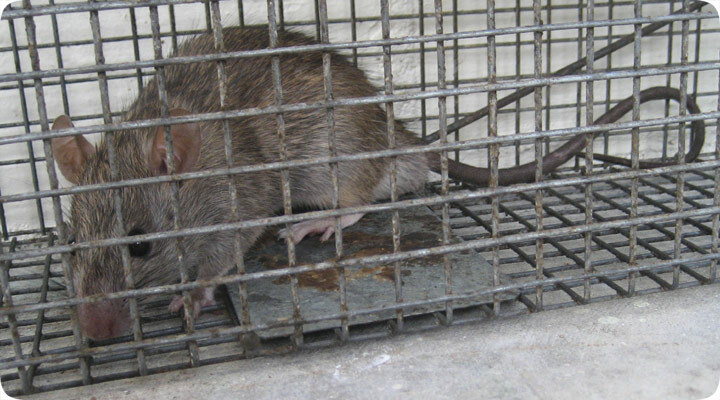 12.18.2006 - Suppose you want to trap rats in a cage, as opposed to using snap traps. It can be done. I personally stick to snap traps most of the time, for a variety of reasons both practical and strategic. However, there are times when I do cage trap rats. The few times I've done so have been by customer request. The principles for cage trapping are the same as for snap trapping. To trap a rat in a cage, set the cage in the right place. Rats tend to use the same paths and runways over and over again. These areas are easy to spot, because the rats leave behind droppings, urine, and a brown grease from their fur. So set the cage traps on these rat runways. The traps should be set firm to the ground, and not shake or tilt upon entry, which will cause the rat to back out. The trap should be baited with something rats like to eat. A variety of foods work, and peanut butter, nuts, and fruit are good ideas. The trip pan, which causes the cage door to slam shut, should be set on a very sensitive level, because rats are so lightweight. Once you've caught a rat in a cage trap, you should relocate it quickly. Rats have a high metabolism, which means that they can't survive for very long without food and water and leaving a rat to suffer in a cage, stressed and starving, is far less humane than a snap trap. You can then relocate the rat outside, but if you release it near your house, be certain that all the rat entry points leading inside have been sealed! If you don't do that, you will always have rats. Trapping rats in cages and relocating them far away will never solve your rat problem permanently.